Due to increasing use of domain specific languages (DSLs), declarative style of modeling is quetly spreading among users of MDE tools. Indeed, it is easy to find examples of declarative DSLs, e.g. at DSM Forums or this blog. There is however a group of users, among which the delarative style of modeling has not managed to spread – transformation developers. I am not sure if it has something todo with the group itself or with the fact that the majority of today’s transformation definition languages (TDL) are still more imperative in style (I am aware of QVT Relations and ATL, but these are rather exceptions than the norm). There are quite a few good reasons why one would consider using a declarative language for transformation definition: reduction of information content in transformation definitions (and hence higher productivity of transformation developers), more agile DSL evolution, transformation definitions as models, higher compatibility with parallel computing, etc..
Today I would like to share some practical results that illustrate reduction of information content due to use of a declarative language. The following examples are kindly provided by Maarten de Mol and Arend Rensink from University of Twente. In CHARTER project, they are working on certifiable transformation technology for development of safety-critical embedded systems. Partially declarative transformation definition language (CHART): based on graph transformation and intended to be useable by Java programmers. Transformation compiler (RDT): given a transformation definition written in CHART, generates its executable implementation in Java. The produced code runs against and transforms user provided data. Figures 1 and 2 present transformation rules findRich and addPicture respectively. Each figure shows its rule written both in CHART and Java. The important Java methods are match() and update(), which are the translations of the similarly named blocks in CHARTER rules. In Figure 1a, a match block counts 10 LOC against 41 LOC in Java (Figure 1b), which constitutes a reduction of information content by 75%. In Figure 2a, an update block counts 12 LOC against 65 LOC in Java, an 80% reduction. Both examples show significant reduction of information content in CHART rules. The reduction is even stronger if one takes into account that Java implementations also have to address technical concerns, which do not exist in CHART rules. In this case reduction is 92% (13 LOC vs. 160 LOC for rule findRich). In experence of another CHARTER partner, who evaluates CHART/RDT in practice, a CHART transformation definition counted 1024 lines of code against 8000 in Java, an 87% reduction of information content . Author’s own industrial experiences elsewhere with AToM3 GG rules (declarative) and QVT Operational (imperative) agree with the above results as well. While exact reduction numbers are certainly arguable, the overal trend in the above experiences is that use of a declarative TDL can result in dramatic reduction of information content and manyfold increase of development productivity. Despite industrial successes of MDE (which are often hidden), it is my experience that model-driven methods have hard times keeping up as organizations evolve. One factor behing this lag is slow speed of transformation development. Practical industrial experiences such as above, show that declarative languages have potential to significantly improve agility of transformation development. What are your experiences with declarative TDLs and agile language development? Can you share concrete examples or provide references to declarative TDLs? 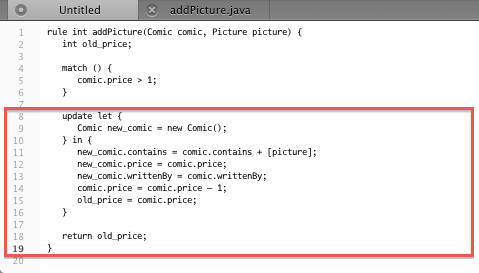 de Mol, M.J. and Rensink, A. and Hunt, J.J. (2012) Graph Transforming Java Data. In: Proceedings of the 15th International Conference on Fundamental Approaches to Software Engineering (FASE 2012), 26-29 Mar 2012, Talinn, Estonia. Lecture Notes in Computer Science. Springer Verlag.